Maiolica, also called Majolica, is Italian tin-glazed pottery dating from the Renaissance period. It is decorated in colours on a white background, sometimes depicting historical and mythical scenes, these works known as istoriato wares ("painted with stories"). By the late 15th century, several places , mainly small cities in northern and central Italy, were producing sophisticated pieces for a luxury market in Italy and beyond. The name is thought to come from the medieval Italian word for Majorca, an island on the route for ships bringing Hispano-Moresque wares from Valencia to Italy. Moorish potters from Majorca are reputed to have worked in Sicily and it has been suggested that their wares reached the Italian mainland from Caltagirone. An alternative explanation of the name is that it comes from the Spanish term obra de Malaga, denoting “[imported] wares from Malaga”, or obra de mélequa, the Spanish name for lustre. In the 15th century, the term maiolica referred solely to lusterware, including both Italian-made and Spanish imports, and tin-glaze wares were known as bianchi (white ware). By 1875 the term was in use describing ceramics made in Italy, lustred or not, of tin-glazed earthenware. With the Spanish conquest of Mexico, tin-glazed maiolica wares came to be produced in the Valley of Mexico as early as 1540, at first in imitation of tin-glazed pottery imported from Seville. Mexican maiolica is known famously as 'Talavera'. "By a convenient extension and limitation the name may be applied to all tin-glazed ware, of whatever nationality, made in the Italian tradition ... the name faïence (or the synonymous English 'delftware') being reserved for the later wares of the 17th Century onwards, either in original styles (as in the case of the French) or, more frequently, in the Dutch-Chinese (Delft) tradition." The term "maiolica" is sometimes applied to modern tin-glazed ware made by studio potters. The word, majolica, is also used for Victorian majolica, a hard-wearing type of pottery where coloured lead glazes are applied direct to the 'biscuit'. Tin glazing creates a white, opaque surface for painting. The colours are applied as metallic oxides or as fritted underglazes to the unfired glaze, which absorbs pigment like fresco, making errors impossible to fix, but preserving the brilliant colors. Sometimes the surface is covered with a second glaze (called coperta by the Italians) that lends greater shine and brilliance to the wares. In the case of lustred wares, a further firing at a lower temperature is required. Kilns required wood as well as suitable clay. Glaze was made from sand, wine lees, lead compounds and tin compounds. Analysis of samples of Italian maiolica pottery from the Middle Ages has indicated that tin was not always a component of the glaze, whose chemical composition varied. The fifteenth-century wares that initiated maiolica as an art form were the product of an evolution in which medieval lead-glazed earthenwares were improved by the addition of tin oxides under the influence of Islamic wares imported through Sicily. Such archaic wares are sometimes called "proto-maiolica". During the later fourteenth century, the limited palette of colours for earthenware decorated with coloured lead glazes (no added tin oxide) was expanded from the traditional manganese purple and copper green to include cobalt blue, antimony yellow and iron-oxide orange. Sgraffito wares were also produced, in which the white tin-oxide glaze was scratched through to produce a design from the revealed body of the ware. Scrap sgraffito ware excavated from kilns in Bacchereto, Montelupo and Florence show that such wares were produced more widely than at Perugia and Città di Castello, the places to which they have been traditionally attributed. Refined production of tin-glazed earthenwares made for more than local needs was concentrated in central Italy from the later thirteenth century, especially in the contada of Florence. The medium was also adopted by the Della Robbia family of Florentine sculptors. The city itself declined in importance as a centre of maiolica production in the second half of the fifteenth century, perhaps because of local deforestation, and manufacture was scattered among small communes, and, after the mid-fifteenth century, at Faenza. Potters from Montelupo set up the potteries at Cafaggiolo. In 1490, twenty-three master-potters of Montelupo agreed to sell the year's production to Francesco Antinori of Florence; Montelupo provided the experienced potters who were set up in 1495 at the Villa Medicea di Cafaggiolo by its Medici owners. In the fifteenth century, Florentine wares spurred the production of maiolica at Arezzo and Siena. Italian maiolica reached an astonishing degree of perfection in this period. In Romagna, Faenza, which gave its name to faience, produced fine maiolica from the early fifteenth century; it was the only significant city in which ceramic production industry became a major part of the economy. Bologna produced lead-glazed wares for export. Orvieto and Deruta both produced maioliche in the fifteenth century. In the sixteenth century, maiolica production was established at Castel Durante, Urbino, Gubbio and Pesaro. The early sixteenth century saw the development of istoriato wares on which historical and mythical scenes were painted in great detail. The State Museum of Medieval and Modern Art] in Arezzo claims to have the largest collection of istoriato wares in Italy. Istoriato wares are also well represented in the British Museum, London. Some maiolica was produced as far north as Padua, Venice and Turin and as far south as Palermo and Caltagirone in Sicily and Laterza in Apulia. In the seventeenth century Savona began to be a prominent place of manufacture. The variety of styles that arose in the sixteenth century all but defies classification . Goldthwaite notes that Paride Berardi's morphology of Pesaro maioliche comprises four styles in 20 sub-groups; Tiziano Mannoni categorized Ligurian wares in four types, eight sub-categories and 36 further divisions; Galeazzo Cora's morphology of Montelupo's production is in 19 groups and 51 categories. The diversity of styles can best be seen in a comparative study of apothecary jars produced between the 15th and 18th centuries. Italian cities encouraged the pottery industry by offering tax relief, citizenship, monopoly rights and protection from outside imports. An important mid-sixteenth century document for the techniques of maiolica painting is the treatise of Cipriano Piccolpasso. The work of individual sixteenth-century masters like Nicola da Urbino, Francesco Xanto Avelli, Guido Durantino and Orazio Fontana of Urbino, Mastro Giorgio of Gubbio and Maestro Domenigo of Venice has been noted. Gubbio lustre used colours such as greenish yellow, strawberry pink and a ruby red. The tradition of fine maiolica died away in the eighteenth century, under competition from porcelains and white earthenware. But it remains commonly produced in many centres, both in folk art forms and reproductions of the historic style. Some of the principal centers of production (e.g. Deruta and Montelupo) still produce maiolica, which is sold worldwide. Modern maiolica looks different from old maiolica because its glaze is usually opacified with the cheaper zircon rather than tin, though there are potteries that specialise in making authentic-looking Renaissance-style pieces with genuine tin-glaze. 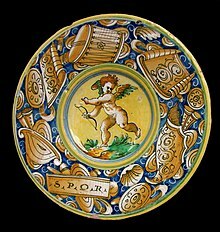 ^ The spelling with long I [like kite, splice], "maiolica", gives rise to the Anglicised pronunciation "majolica", which is also used for 19th-century lead-glazed earthenware [coloured lead glazes applied to biscuit, then fired]: see Majolica. ^ L. Arnoux, 1877, British Manufacturing Industries - Pottery "Most of the Italian towns had their manufactory, each of them possessing a style of its own. Beginning at Caffagiolo and Deruta, they extended rapidly to Gubbio, Ferrara, and Ravenna, to be continued to Casteldurante, Rimini, Urbino, Florence, Venice, and many other places." ^ C. Drury E. Fortnum (1892) Maiolica, Chapman & Hall, London, quoted in E.A. Barber, (1915), Hispano Moresque Pottery, The Hispanic Society of America, New York, pp. 25-26. Also published in 1876 by Scribner, Welford, and Armstrong, New York. ^ Sweetman, John (1987), The oriental obsession: Islamic inspiration in British and American art and architecture 1500-1920, Cambridge University Press, Cambridge. ^ Florence C. Lister and Robert H. Lister, Sixteenth Century Maiolica Pottery in the Valley of Mexico (Tucson: Anthropological Papers of the University of Arizona) 1982. ^ 'Tin-lead ratio of late Middle Age majolica glazes of some important Italian sites.' A.Krajewski, A.Ravaglioli, G.W.Carriveau. J.Mat.Sci.Lett. 11, No.12,1992.Pg.848-851. ^ Richard A. Goldthwaite, "The Economic and Social World of Italian Renaissance Maiolica" Renaissance Quarterly, 42.1 (Spring 1989 pp. 1-32) p. 1. ^ Hugo Blake, "The archaic maiolica of North-Central Italy: Montalcino, Assisi and Tolentino", Faenza, 66 (1980) pp. 91-106. ^ David Whitehouse, "Proto-maiolica" Faenza 66 (1980), pp 77-83. ^ Galeazzo Cora (1973) noted kilns dispersed at Bacchereto (a center of production from the fourteenth century), Puntormo, Prato and Pistoia, none of them site-names that have circulated among connoisseurs and collectors. ^ Reproduced in Cora 1973. ^ In the villa's 1498 inventory, it is noted that in the villa's piazza murata (the walled enclosure), there are fornaze col portico da cuocere vaselle ("kilns for baking pottery"), let to Piero and Stefano foraxari, the "kilnmasters" of the maiolica manufactory for which Cafaggiolo is famed. These are Piero and Stefano di Filippo da Montelupo, who started up the kilns under Medici patronage in 1495, earlier than has been thought (Cora 1973 gave a date 1498); John Shearman, "The Collections of the Younger Branch of the Medici" The Burlington Magazine 117 No. 862 (January 1975), pp. 12, 14-27 gives 1495, based on a document. ^ The standard English translation is The Three Books of the Potter's Art, translated and introduced by Ronald Lightbown and Alan Caiger-Smith, (London) 1980.